If you’re a fan of children’s books, you won’t want to miss From Apple Pies to Astronauts, A Chronology of Alphabet Books with Aphorisms, Amusements, and Anecdotes! at UBC Library’s Rare Books and Special Collections. The exhibit offers a selection of English language alphabet books from the late 18th century to the present day. These books illustrate the changes in alphabetic education for young children in England, the United States, and Canada. The exhibition is curated by UBC Master of Library and Information Studies candidates Sarah Bagshaw and Laura Quintana, under the supervision of Professor Kathie Shoemaker. 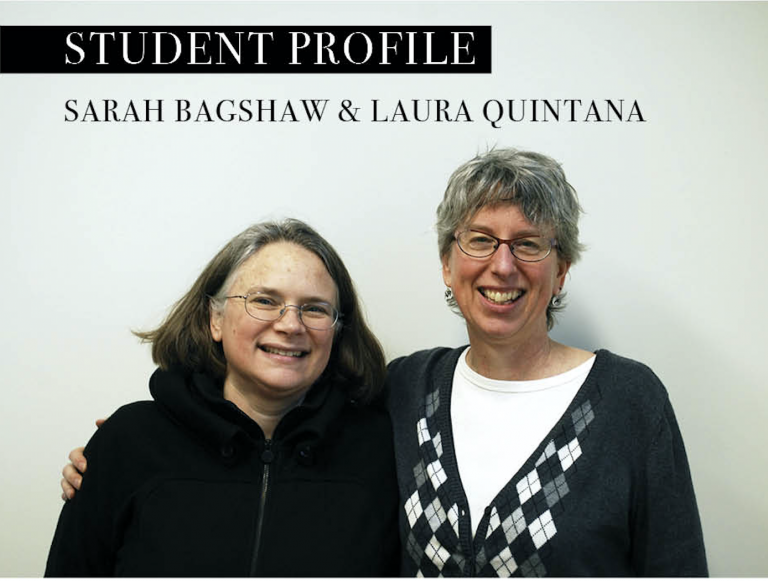 We chatted with Laura and Sarah about their curation process. What inspired you to create an exhibit around Alphabet Books? Sarah: The books themselves were the inspiration. Once Kathie Shoemaker suggested the idea, I got to search for alphabet books in the Rare Books and Special Collection catalogue. Then I got to go and look at them and was amazed by all the different styles through time, all the differences and similarities to alphabet books now. In discussing what I was looking at with my husband, he suggested displaying them in chronological order as well as going through the alphabet from A to Z. This turned out to be an excellent way to showcase the books and the changes in illustration, the way they were written, and their educational purpose over time. Laura: It was Sarah’s idea, actually. I got into the project in a later stage and helped her with everything I could. I have to say that I found the project really interesting. I did not grow up with Alphabet books and during our research we found out that in countries with languages other than English it is not as common as it is here to use alphabet books as an introduction to literacy. What intrigues you about children’s books? Sarah: Children’s books are amazing. There are so many wonderful books being published for children today. Picture books are particularly fascinating as they tell stories with both text and pictures. The types and styles of illustration we see now in picture books is incredible. They are a window into the cultural context of the time period they come from as well as an entertainment piece for both adults and children. Picture books are not easy to create. They have to tell a story well and the text cannot fall down on the job – it has to work being read out loud. Current writers could take a page or two from the writers of the past! The rhyming text in the old alphabet books in the exhibit was a joy to read. Laura: There is a common misconception that understands children’s literature as a second class kind of literature, as if authors and publishers were lowering their scales to produce books that appeal to children but are not good enough to engage adults. And it often happens that adults who read children’s literature are seen as infantile. Children’s literature has a specific audience, and that audience is the most demanding and honest of all. Authors need to really address a particular need and satisfy very high expectations. Children know what is good and what is not, and they won’t read a book that does not give them what they are asking for. Another important think to highlight is that children are still able to see the marvels of the world. Children’s books authors need to honor the splendour of that point of view and produce books that fully satisfy the children’s need for beauty, and that is not an easy thing to do. Alphabet books address a learning expectation, but they also appeal to children through illustrations, text, reading rhythm and originality. They are a learning tool and also a source for enjoyment. Alphabet books these days can be simply amazing. How did the two of you come to work on this project? Sarah: Kathie Shoemaker approached me last summer while I was taking her Illustrated Materials for Children course about possibly putting together an exhibit of alphabet books in the Rare Books reading room. This sounded like such a cool idea! Everyone in the West who speaks English is familiar with alphabet books, we all grew up with them and there are so many different kinds. To be able to look at old alphabet books as well as find beautifully illustrated new ones was so much fun. Laura: Sarah had already created the concept, and her enthusiasm and passion was contagious. How did you select the books displayed in the exhibit? 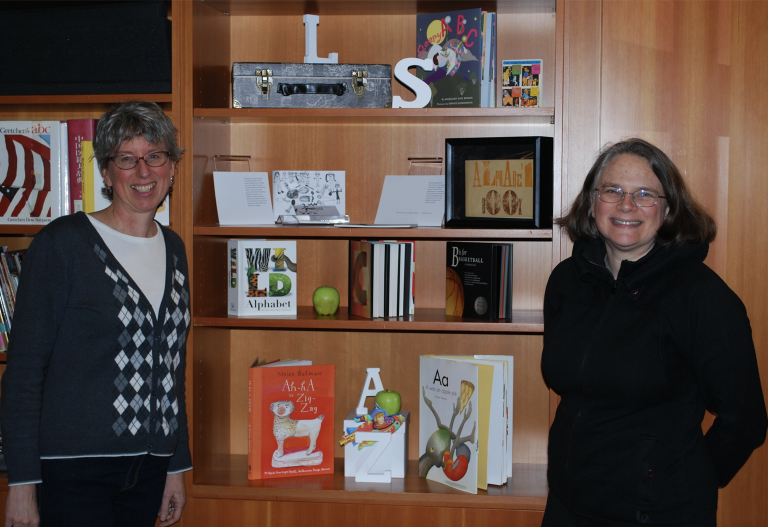 Sarah: Once we had the idea for a chronological tour, we selected books that best represented different eras or decades in the development of early childhood learning and alphabet books. Some of the more recent alphabet books are very well known, but we felt that they should be included as they represented either specific ideas about children and learning, or a change in illustrative style. Everyone knows Dr. Seuss, so did we need to have him in this exhibit? Yes!! He represents a big shift in the thinking about children, learning, and books. Each book has a reason for being in the cases even if we didn’t create a lengthy item label for it. We were really lucky that Kathie has an extensive library of alphabet books to choose from and I also asked friends and family to search their libraries. Laura: We looked for the most appealing materials, and also for the ones that best represented a particular moment in time and in the evolution of Alphabet books. Do you have a favourite alphabet book? Sarah: That’s hard. There are certain books that have a nostalgia for me, like Cecily Mary Barker’s Flower Fairy Alphabet because I grew up with it, as well as Dr. Seuss. Chicka Chicka Boom Boom because we read that to our daughter and the rhythm in it is so spot on. However, now that I have seen all these old alphabet books, I find the Battledoor fascinating for what it is and for showcasing street vendors from the early 19th century. Wanda Gag’s ABC Bunny is such a good example of picture and text working together to tell a story. The old alphabet books I got the most excited about are the ones illustrated by Walter Crane, who was part of the Arts and Crafts movement. He worked with William Morris. So many interesting things to read about him and his art! Laura: I fell in love with several of them, but if I have to choose it would be Chicka Chicka Boom Boom, with all its rhythm and freshness. I also love The Neverending Story since I was young, and until now I have never thought about the fact that it was written as an alphabet book, with chapters that start with a letter of the alphabet, in order. I found that very interesting. Sarah: Another hard question! My family is British and so I grew up with books from England. I still have the copy my Granny sent me of Enid Blyton’s Magic Faraway Tree. I blame this book for my love of fantasy and my fascination with doorways to other places. I also have a soft spot for Wind in the Willows, original Winnie the Pooh, and A Child’s Garden of Verses by Robert Louis Stevenson. I pinched the family copy of The Real Mother Goose illustrated by Blanch Fisher Wright to use with our daughter and love looking into the history of weird and obscure nursery rhymes. Clearly the rhyming and rhythm of text read out loud is important to me! Laura: My favourite book as a child was Peter Pan in Kensington Gardens. I’m still in love with this concept of Peter Pan as a newborn child who can fly, who used to have wings and is able to fly because he does not know that that is impossible. In this book he does not need fairy dust or the help of Tinker Bell to be able to fly. I felt so sad when I first read it: to think about a child who flies away from his mother and finds out later, when he wants to come back, that the windows have been barred and that his mother has a new baby that has taken his place. I think that it is a wonderful book with an extraordinary, powerful and heartwarming main character. From Apple Pies to Astronauts is on display at UBC Library’s Rare Books and Special Collections on the first floor of the Irving K. Barber Learning Centre from February 27 through April 30, 2017, and can be viewed Monday through Friday from 10 a.m. to 4 p.m. and Saturdays from 12-5 p.m. The exhibition is free and open to the public, and people of all ages are encouraged to attend. For more information, please contact Rare Books and Special Collections at (604) 822-2521 or rare.books@ubc.ca.